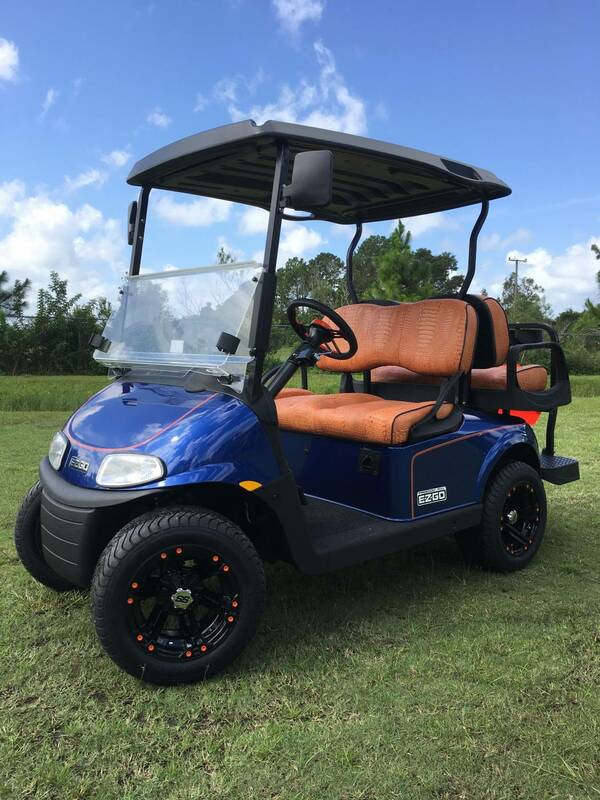 New 2017 EZGO RXV Freedom electric golf car, color: Electric Blue, complete with headlights, taillights, brake lights, electric horn, 8v batteries, AC motor, high speed option, Turn signals,wraparound bumper,Luxury Bench Croc Seats with flip seat in the rears, sweater basket, rake holder, 4 cup holders, charge indicator, BLACK sun canopy, plastic battery tray, automatic Quick-Q charger, lifetime frame warranty, 3year Limited car warranty, 90 day warranty on accessories, does not include service call, please refer to owner’s manual. Call us for your Custom Build! Go Gators ! !